Cross of Golden Delicious and Jonathan (but different from Jonagold). 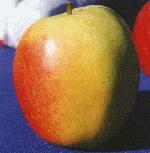 Deep yellow, with a pink blush on one cheek, it is a sweet-tart apple that ripens in late October in the Willamette Valley. Good for fresh eating, juice, and cooking. Good keeper.